caliber and a 7mm Remington Magnum barrel. I understand the seriousness of mixing black powder, bullets and shotgun primers in a high pressure environment. I read the manual and paid extra close attention when the manual emphasized the point that “failure to follow all instructions and warnings may result in serious injury or death to you or others”. Do I really want to do this? Firearms can be dangerous and nothing about handling, transporting, loading or shooting them should be taken lightly, but I remember there was a warning about physical injury that came with the last pair of nail clippers I bought. They won’t let you get on an airplane anymore with nail clippers, so they must be dangerous. There is a similar warning on the box of .45 auto ammo here in my office and it also includes warnings about the dangers of lead poisoning. This was my first experience with a muzzleloader and I had only seen one muzzleloader up close before. I wished I had paid more attention to a friend’s old-school muzzleloader when I had the chance. I’ve been hunting with him as a spotter and helped him drag his mule deer back to the truck that he took with that muzzleloader. He was smart guy, but he wasn’t no brain surgeon. If he could do it, so could I. Here are some things I have learned from other people and sources or have discovered for myself. When loading a muzzleloader, you will violate the first rule of handling firearms. You will put your fingers and hands in front of the barrel. Do not compound this problem by also placing your head or chest in front of the barrel. The barrel needs to be lubricated and then swabbed to remove the excess – imagine what your powder will look like if you leave as much bore butter in the barrel as you put on your toast, then rammed the powder and butter mix down the barrel. Never put more than 100 grains of powder or pellets for a standard muzzleloader and never use more than 150 grains for a magnum muzzleloader. If you have a magnum capable barrel, the word “Magnum” will be stamped on the barrel. Follow the instructions provided by the manufacturer of your muzzleloader. If you lose count of the pellets or are not 100% sure you have not added two loads of powder, don’t take the chance. Pour it out and start over. If the breech plug is dirty, clean it. Make sure the hole in the breech plug is clear. Some folks like to fire one or two primers without loading the gun to make sure the plug is clear. I prefer to clean the breech plug as firing the primer also makes the chamber dirty and so far, I have never had a primer fail to ignite the powder charge. When using pellets, use the provided pipe cleaner to move the pellets by sticking the pipe cleaner into the hole of the pellet. Note that Pyrodex pellets need to be loaded with igniter side toward the breech (See note and photos below). Triple seven pellets can be loaded any direction. If the barrel is dirty, it may be extremely hard to push the bullet into the barrel especially for models with tight barrels and if using thicker sabots. Make sure there is no space between the bullet and the powder. The ramrod can be marked (witness mark) to help load bullet to the same depth for consistency if using same bullet and load of powder. If the load can not be safely shot for any reason, remove the barrel and breech plug. Powder can be poured out and pellets can be soaked in water until they dissolve. The bullet can be carefully tapped out with a ramrod or wooden dowel. Make sure gun is empty, the barrel is pointed in a safe direction and the hammer is down. 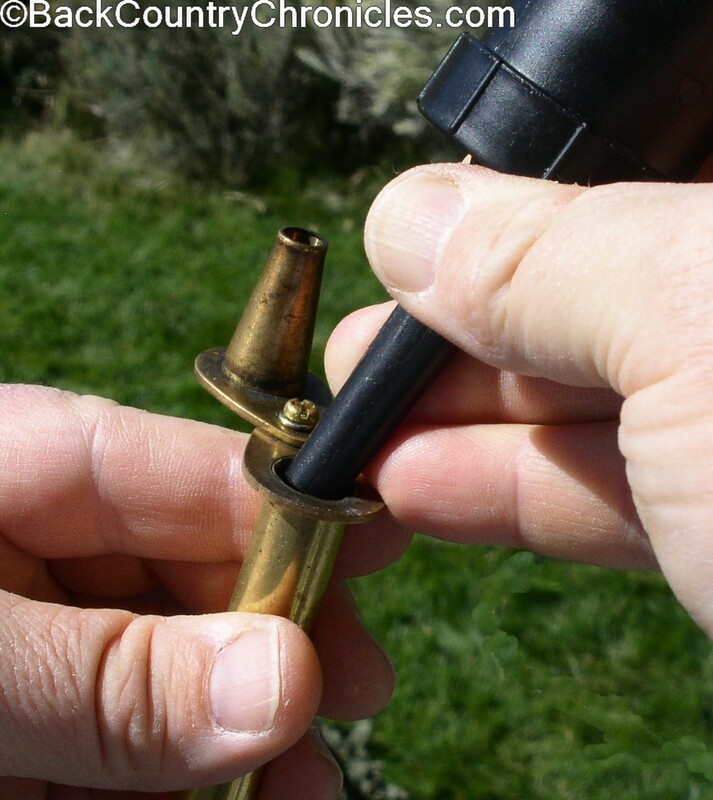 Make sure there is no primer is in the back of the breech plug and then close the breech. Measure the correct amount of powder or select the correct number of pellets (see notes and photos below). 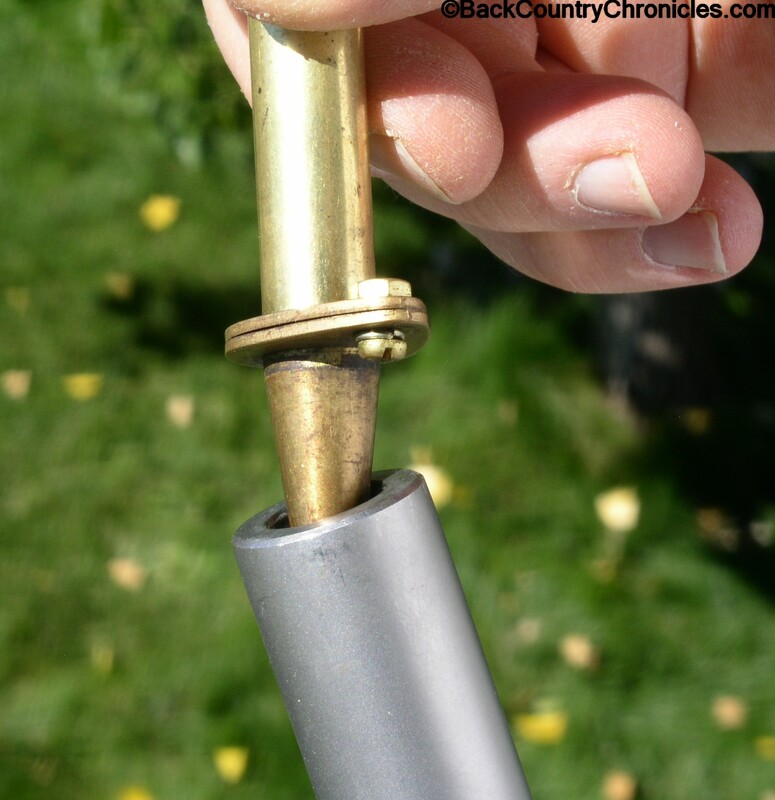 With barrel pointed up in a safe direction, pour powder or drop pellets down the barrel. See note and photos below on correctly loading Pyrodex pellets. Check to make sure all the powder came out of the powder measure or speed loader – old powder can attract moisture and start to clump and doesn’t always pour well. Place bullet (ball, miniball, bullet or sabot and bullet) into the barrel. 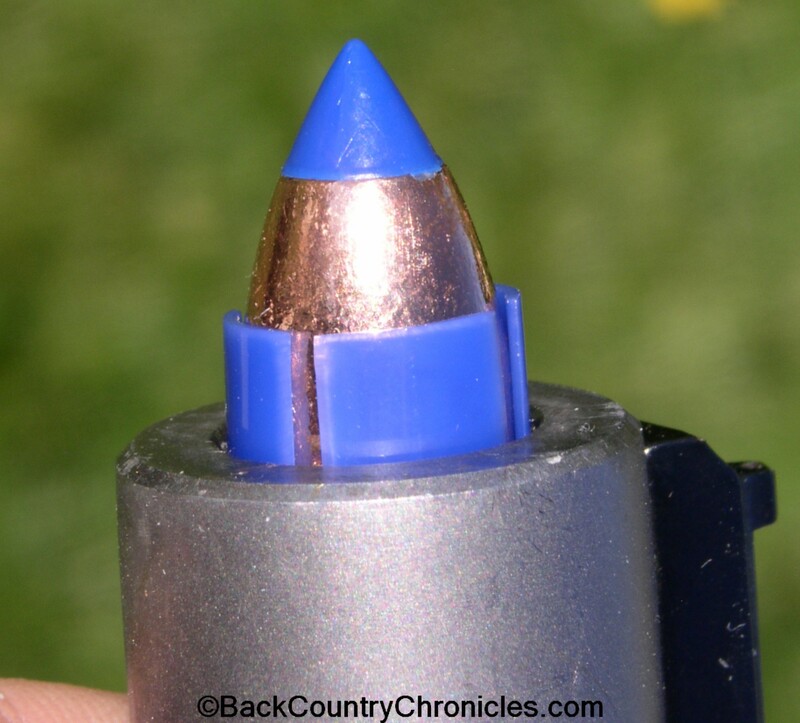 The bullet pictured is a 250 grain Barnes T-EZ with sabot. Push bullet into the barrel with the ball starter, using the correct aligner tool to make sure the bullet loads straight. The bullet aligner tool pictured fits Barnes TMZ and T-EZ bullets. Completely push bullet all the way down the barrel with the ramrod until it rest firmly on the powder or pellets. If using pellets, also be careful and try not to crush the pellets. Check to make sure the aligner tool is still attached to the ramrod and not left behind in the barrel. With muzzle pointed in a safe direction, open the breech and insert a 209 shotgun primer into the back of the breech plug and close the breech. The gun is now ready to fire, so handle safely and practice the only gun control that we should allow and hit the target. 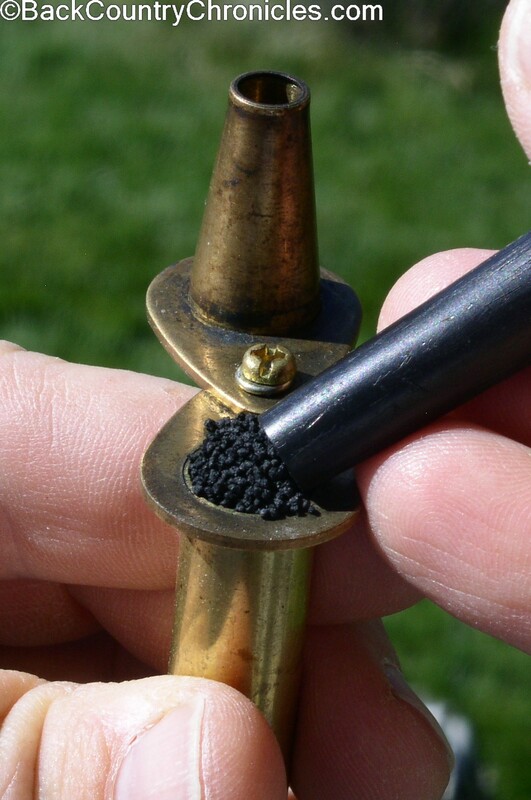 The correct amount of black powder or black powder substitute can be measured with a black powder measuring tool. 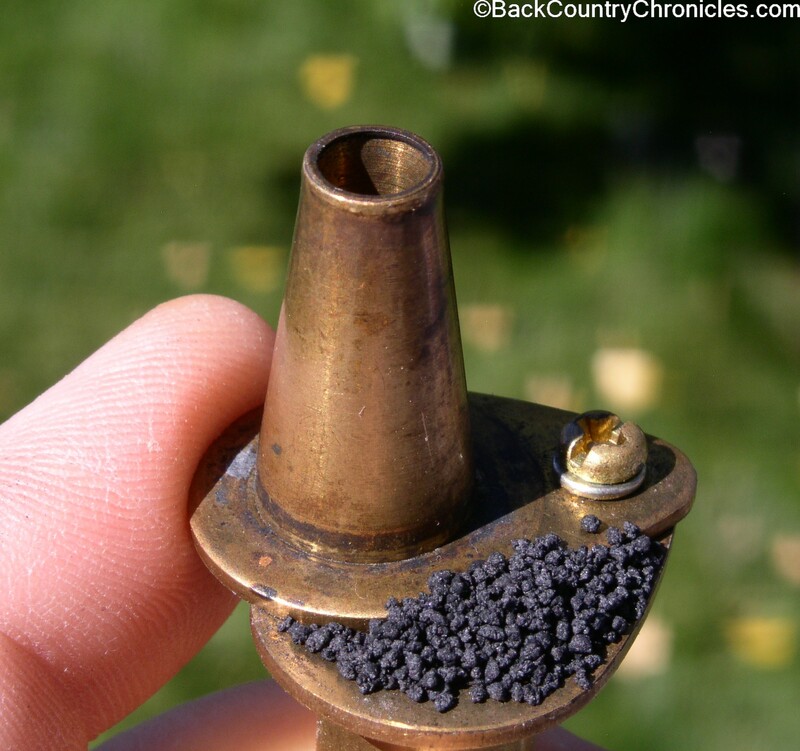 Black powder substitutes are produced to be measured by volume to be equivalent to black powder. Black powder and substitutes are measured in grains. Do not measure black powder substitutes by weight. 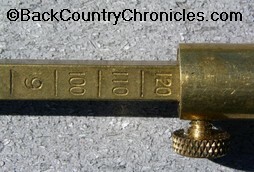 The powder measure in the photo is set to measure 120 grains of powder. The powder measure is filled with black powder such as Goex or with a synthetic black powder substitute like Pyrodex or Triple Seven, until the measure is slightly overfull. The excess powder is removed by closing the cap. 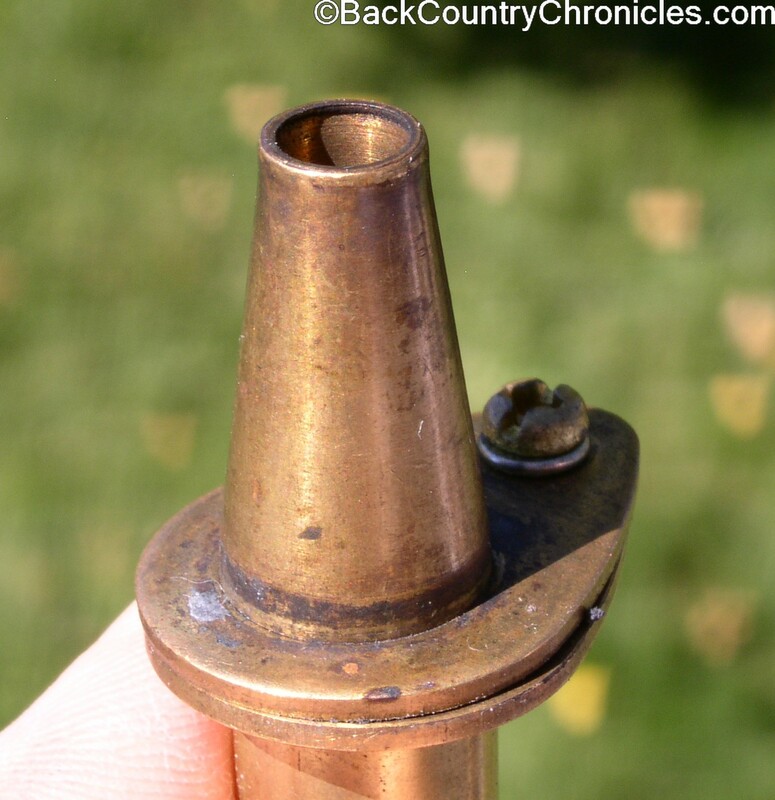 When the cap is completely closed, it forms a funnel and is ready to pour the powder into the gun barrel. Click on the thumbnails below for larger photos. 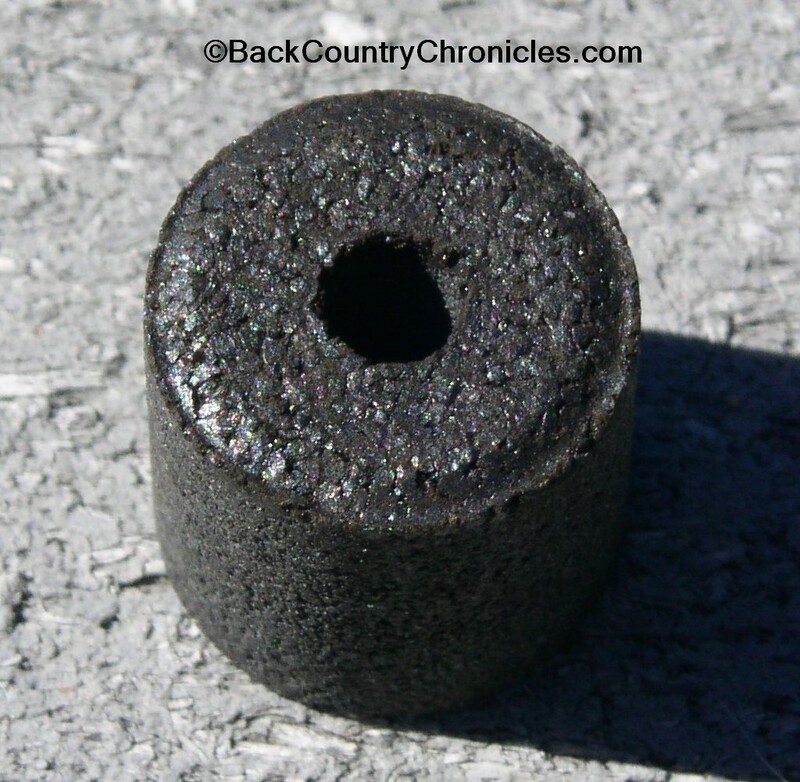 Pyrodex pellets have have a flat side and a slightly rounded side that is black instead of grey. 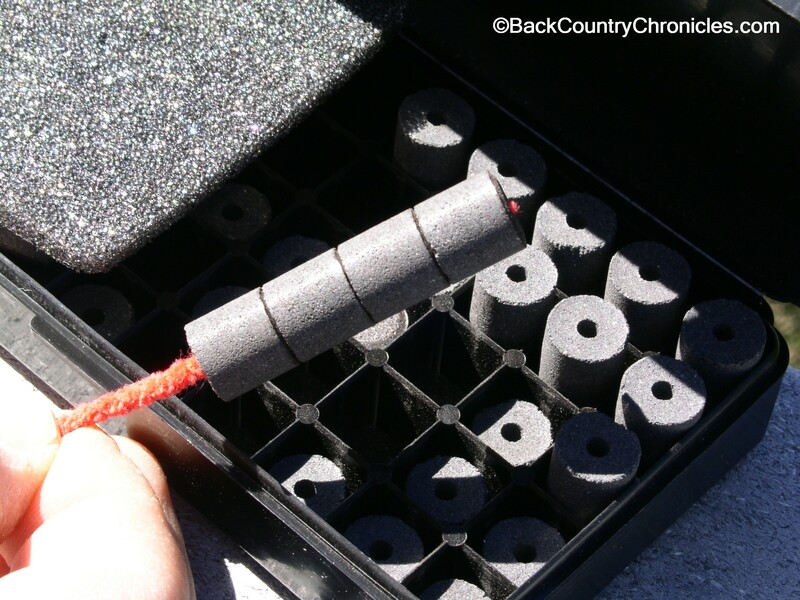 The rounded black end has an igniter coating, made of black powder on each pellet. For best ignition, the igniter end should be placed toward the breech. Click on the thumbnails below to see larger photos showing the igniters. Everybody has a first time. The first time I took my Thompson Center Encore to the range was just to get the feel for both the 7 mm and the muzzleloader. I sure hoped that I had everything I needed for the muzzleloader. I must have looked like new parents do when trying to carry all that “stuff” around with the new baby. I shot the 7mm first, but I’ll cut this part short since this is supposed to be about learning to shoot the muzzleloader. I shot about a dozen rounds with the 7mm and was pleased, the scope was set dead-on at 2 inches high at 100 yards. I could definitely work with this. I quickly pulled the 7mm barrel off by removing the two screws on the forearm and tapping out the hinge pin. 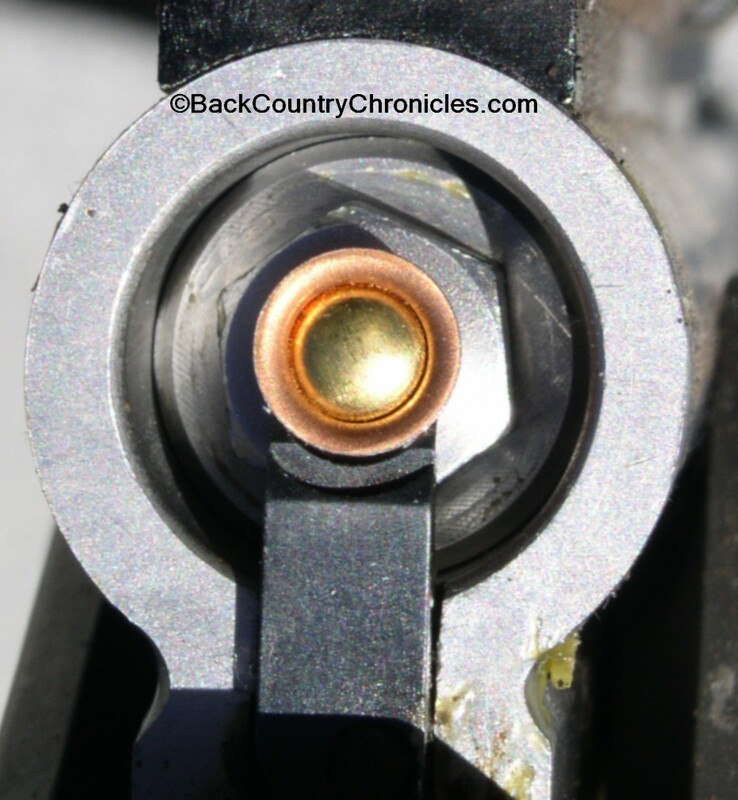 I line up the hinge pin hole of the muzzleloader barrel with the hole in the frame. I replaced the hinge pin and secured the forearm with the two screws. That was easy it only took about two minutes as claimed by Thompson Center even though I had only changed barrels a few times. This is a good design. I reached into my gear bag and pulled out two boxes of pellets (30 grain and 50 grain), bullets with sabots, bullet starter, shotgun primers and also pulled the ramrod from the gun and laid everything out on the shooting bench. I must have set there for a minute just looking at everything, when the guy that was shooting beside me noticed and said “Cool, a muzzleloader, I have had one for years”. “That’s good”, I said. “This is my first time shooting it”. Nice to have someone that could help me out if I needed it. I stood the gun up and dropped one 50 grain pellet down the barrel. I was just testing and didn’t need to go with a magnum load for the first shot. I selected a bullet and sabot from tackle box and pushed it into the barrel. At the time, I didn’t even know what brand the bullet was, as they were included in the tackle box when I bought the gun. Later, I identified them as 250 grain Thompson Center Shockwave bullets and sabots. I took the ball starter (with an appropriately shaped aligner tool) and pushed it down the barrel as far as the ball starter would reach. I picked up the ramrod and attached the same aligner tool to the ramrod and started pushing the bullet into the barrel. It was tight. Normally, I think it is a good rule not to force anything into position without careful consideration, so I stopped and ask the guy beside me if it was normal to require so much force to push in the bullet. He said it was normal and even came over to check it out. I handed the gun to him and he pushed the bullet down the barrel. He said “Yep, that’s normal and sometimes it’s even harder”. I thanked him for his help and began to prepare for my first shot. I had no idea if he crunched the pellets or not, but now I knew what to expect when pushing a bullet down the barrel. I broke the breech open and placed a primer in position. Well here goes nothing. I pointed the gun at the target and lined up the sights. When everything felt comfortable, I cocked the hammer. I took a deep breath and lined up on the target again and held steady, then slowly squeezed the trigger. The bang from 50 grains of powder was not very impressive and the kick was very modest, but the smoke from the blast was impressive and I’m not sure why, but I liked it. I was hooked from the start. I re-loaded with progressively heavier loads; 100 grains, then 150 grains just to get a feel for the loading process and the gun. The report and the smoke was very impressive with 150 grains of powder, but the kick was still very manageable. Maybe it was a good thing that I put the new Flex Tech stock on the gun. OK, I knew how to safely load and fire the muzzleloader, the next step was to learn how to shoot accurately with it. Though we are being told that the total number of hunters is decreasing, it seems like more and more people are getting into shooting and hunting with muzzleloaders, especially the modern in-line rifles. But compared with centerfire rifles, it is still just a drop in the bucket. The last four of five times that I have taken my TC Encore to the local range, the Range Safety Officers and some of the other shooters have shown a keen interest in the muzzleloader. They were watching what I was doing and asking questions. Most of these guys are experienced shooters and re-loaders, but for whatever reason, just never got into shooting muzzleloaders. I am also still amazed that so few people know about the inter-changeable barrels of the Encore system. It’s probably that way about most things for most people. My father and grandfather hunted mostly small game with shotguns and .22 rifles, so that is what I did when I was younger. Since I have moved out West, there are more opportunities to hunt big game and I actually lucked into muzzleloading while looking for a center fire rifle. I bought both (center fire and muzzleloader) at the same time when I got my Thompson Center Encore. Chances are, if you already shoot a muzzleloader, a family member or a good friend got you started. I am torn between encouraging you to get a muzzleloader and start shooting and hunting and hoping that you don’t so the competition for tags or hunting space stays low. Where I live, Limited Entry tags are hard to get and even over the counter tags are limited for mule deer, but still guaranteed for elk. It is easier to get tags for the mule deer for the muzzleloader season and I have been able to get a muzzleloader mule deer tag two years in a row. I like the fact that I have not seen a single person during the past 2 years while hunting elk or last year while hunting mule deer during the muzzleloader seasons. I saw guys on the roads, but never saw anyone in the field. The mule deer muzzleloader season starts tomorrow morning at O’dark 30. I hope I don’t see you, except in camp and on the roads. So good luck out there and be safe. Update: Since I wrote this, I have been able to get a muzzleloader buck mule deer tag for 10 years in a row and I finally took a cow elk with my muzzleloader instead of rifle in 2018. I only saw two hunter in the field during the elk or mule deer muzzleloader hunts until two years ago. I think changing the law to allow hunting with magnified scopes during the muzzleloader season increased the interest in hunting with muzzleloader in my state. No wonder there were so many muzzleloaders at the range before the hunt season that year. But even with magnified scopes, most couldn’t shoot 6 inch groups at 100 yards. Best 50 cal load for Black Bears? That depends on several things. 1 – are you hunting from a blind where shot distance is less than 50 yards? 2 – are you stalking, where shot could be 100 yards or more? If shot will be close, accuracy is less of an issue. If close, I would load 120 – 150 grains of powder with a Barnes T-EZ or TMZ 290 grain bullet. 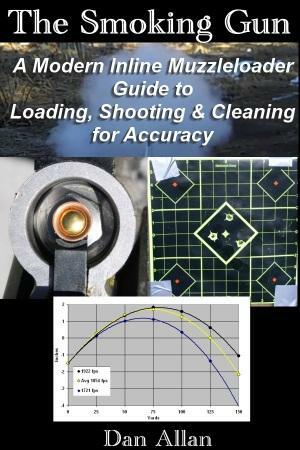 If you need accuracy, you will need to test several combinations to find the most accurate load for your Remington. I would start testing with lighter loads like 90 or 100 grains of powder and I would start testing with a Barnes 290 grain bullet and sabot. Increase loads by 5 – 10 grains until you get the best groups. You should be close to 1 inch at 100 yards. If you can’t get good groups, start over with 90 grains and a different bullet. Very well explained. Thanks for the post, be safe.